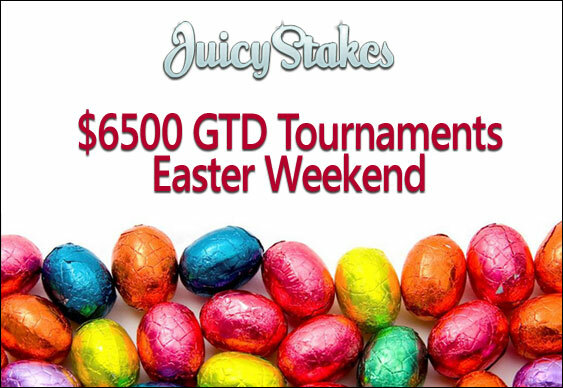 The Easter weekend is fast approaching and to ensure you're able to stuff yourself with more than just chocolate, Juicy Stakes Poker is giving away $6,500 in guaranteed tournament cash. If the idea of doing some DIY or spending time in a shopping centre doesn't sound appealing, then make sure you check out the Easter freerolls at Juicy Stakes Poker. Kicking off on Saturday and with a total of $6,500 on offer, these multi-table tournaments and freerolls are a great chance for online poker fans to enhance not only their waistlines over the Easter weekend. On top of this, Juicy Stakes Poker is also hosting two additional freerolls this evening with $1,250 up for grabs. Kicking off at 7pm and midnight London time respectively, each tournament will cost $0 to enter and there are no special codes needed. Indeed, to take part in any of this week's special freerolls, simply download Juicy Stakes Poker, take advantage of a 200 percent first deposit bonus and make sure you're registered in time for the events.